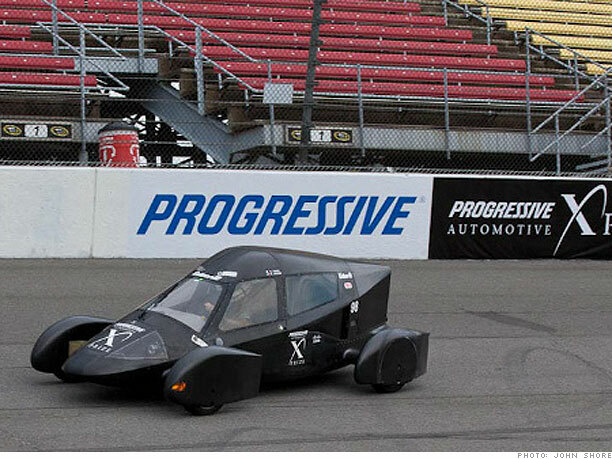 The Progressive X-prize highlights fuel efficient technology. The X-prize Foundation showcases and rewards cutting-edge innovations in fields that have the potential to benefit humanity. The Automotive X-prize is for fuel efficiency. Sponsored by the Progressive insurance company and partially funded by the Department of Energy, it was given in three different vehicle classes. Regardless of the class, the cars had to be safe, "commercially viable" -- meaning only that they had to perform more or less like a regular car -- and they had to get at least 100 miles per gallon or the equivalent. The contest was launched in 2008. Beginning this summer, the 136 vehicles that entered -- representing 111 teams from around the world -- were winnowed down through a serious of tests. Besides fuel economy, cars were also tested for things like acceleration, braking, handling and maneuverability. In the "Mainstream" class, which offered the biggest cash prize, vehicles were required to have four wheels, seat four people and have a driving range of at least 200 miles. In other words, they had to offer the bare basics of a typical car. Edison2, a team that fielded entries in all three classes, used a small internal combustion engine rather than an electric motor or hybrid power. The car relied largely on its light weight -- no heavy batteries -- and its best-in-class aerodynamics to win the prize.